Lithium is probably the most newsworthy metal in decades. Formerly a small niche item for batteries and mainly used in ceramics and glass, it has become mainstream—in a huge global way—with first the rapid rise in personal electronics, and now energy storage for upstream renewable power and downstream Electric Vehicles (EVs). Roughly 40% of lithium demand goes to the battery business today and energy metals specialist Chris Berry has this percentage rising to as much as 66% by 2025. Lithium has singlehandedly turned the entire multi-billion US utility industry on its head. And it is creating massive opportunities for investors because an entire new supply chain is developing around energy storage and EVs. One of the biggest opportunities was possibly announced yesterday, as FMC Corp. (FMC-NYSE) said it planned to spin out its lithium division in the second half of 2018. Right now, the Market does not have a BIG, primary US listed, pure play producer for lithium. Having said that, senior companies like Albemarle (ALB-NYSE), SQM (SQM (NYSE), and FMC have traded on lithium prices and their earnings on lithium—despite both only having a small part of their overall revenue as lithium. The key is the margins that these companies generate from lithium. ALB is showing operating margins of 40+% for the past two years or so—very profitable! The stock chart on Albemarle is clear: lithium is the driving factor on this senior stock. 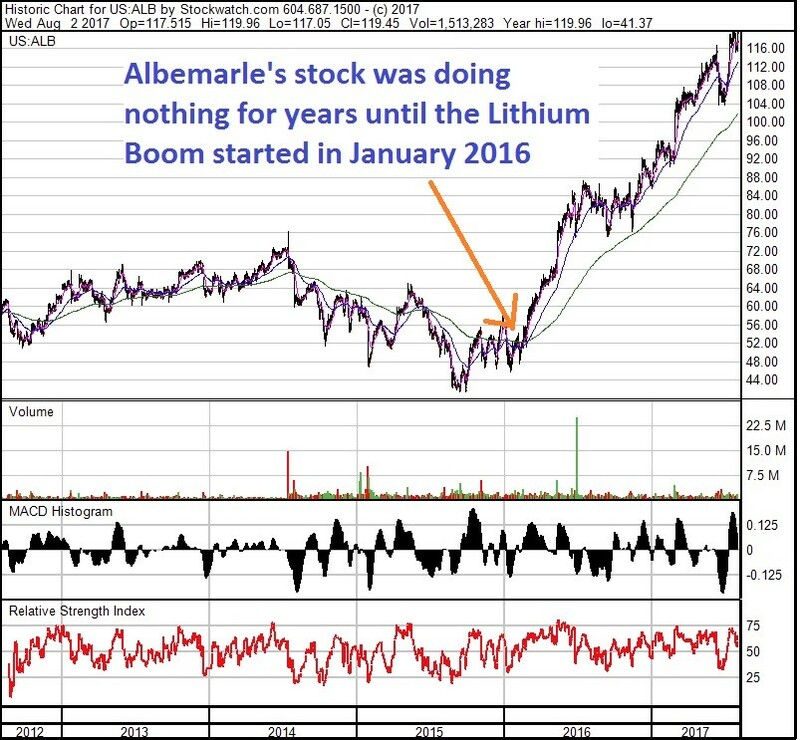 The stock languished for years, but in January 2016, when the lithium boom really took off—so did Albemarle, going from $47 then to $120 today (ok, $119.96). I made a lot of money on lithium stocks back then (remember how I told you all I was buying Lithium X (LIX-TSXv) at 30 cents & it went to $2.80 in weeks?) but I ignored Albemarle because I didn’t think the Market would adopt it as a lithium stock because it was only a minority metal for the company. I was sure wrong there! FMC’s timing looks good. It turns out lithium is quite profitable at these prices! FMC announced strong earnings with lithium segment revenues up 17% YOY at $74M and segment earnings up 47% at $24M. Despite the fact that FMC’s results were buoyed more by price than volume (which fell 2%), the company has raised its 2018 lithium sector earnings guidance to $115M – $125M up from $100M – $120M. Lithium only accounts for 11% of FMC’s revenue, but the company announced a capacity expansion in its lithium hydroxide and lithium carbonate businesses to 30,000 tpy and 40,000 tpy respectively. For the sake of context, the lithium hydroxide market is thought to be 30,000 to 40,000 tpy in size today. That’s so big you wonder if that will kill margins for the industry. The carbonate expansion will focus on growth in the company’s Argentina operations and will cost $250M – $300M; in line with typical industry build outs. While the hydroxide expansion plans weren’t as clear (specifically security of supply and costs), the company will focus on this as lithium hydroxide has become the lithium chemical of choice in the battery business due to higher energy density. A look further down the lithium ion supply chain confirms strong growth there as well. Umicore, the Belgian battery technology company, posted strong H1 results led by their “Energy and Surface Technologies” (EST) Division with revenues up 38% to €398M ($471 USD) and recurring EBIT up 66% to €61M ($78M USD). Albemarle and SQM report later this month and are likely to reveal a similar story around pricing strength in the lithium sector. So ALB-NYSE stock performance and lithium correlation was a surprise for me. There was Another Big Surprise, though more recently, and I think it sets up The Lithium Boom for a much larger and longer run than I ever thought could happen. And that is the CEOs of both oil companies and auto manufacturers moving towards EVs faster than I ever thought. Volvo (STO: VOLV-B) in Sweden and Volkswagen (ETR: VOW3) in Germany have said they are making the transition to becoming EV manufacturers in just a few years. From 2019, Volvo will only produce hybrid and full EVs – no production of automobiles with only an engine. Usually, industry lags public opinion on Big Changes like the EV Revolution, but now I wonder if we could see auto manufacturers create more EVs so fast buyers can’t keep up. This all depansd on security of supply which is why understanding opportunities in the upstream mining sector is so important. Back in early 2016 as the lithium boom started, I was confident it wouldn’t last more than a couple years, and had planned to forget about lithium as the majors brought on production. But not only has demand increased more than expected, lithium extraction has taken longer than expected. The Market has (dramatically, actually) under-estimated permitting and development cycles. The lithium producers may catch up in the next 1-2 years, but right now nobody is betting on a huge increase in supply in the near term. That will keep the price of lithium high, and create a lot of opportunities for investors. In the junior sector, not only are new lithium deposits being explored, several companies are now trying to develop technologies that will recover lithium brine from oil waste (which occurs naturally). That’s why I’m going to keep writing about energy metals. Wherever there’s innovation, investors can make money. As lithium goes from niche to global mainstream metal, billions will get raised getting new assets and technologies into play. With FMC’s announced expansion yesterday, year to date over $1B USD has been raised or committed for lithium project development. FMC’s spinout is just another validation that the Street is getting behind this upstream way to play the multi-year EV trade. EDITORS NOTE: My experience is that table-pounding buys in the energy sector only happen once every 12-18 months. Resolute Energy (REN-NYSE) was my last one, just over a year ago, and it went from $5-$48 in just a few months. I JUST FOUND MY NEXT ONE…and I can’t believe I’m going to give it to you for just $5–FIVE BUCKS…Click HERE to access the name and symbol.